A long time ago, the Hawaiians named this species of seal “llio holo I ka uaua” (dog that runs in rough water). Now the Hawaiian monk seal has become one of the most endangered species in the world, with only about 1,100 remaining. When this particular seal came in to sleep on Poipu beach in Kauai—the Hawaiian Monk Seal Response Team was immediately alerted. A volunteer arrived quickly and placed a rope barrier around the area to assure that the seal would not be disturbed while resting. Viewing of the seal was allowed from a safe distance, and close-up photos were easily taken with a zoom lens. The volunteer kindly stayed to watch over the sleeping seal. 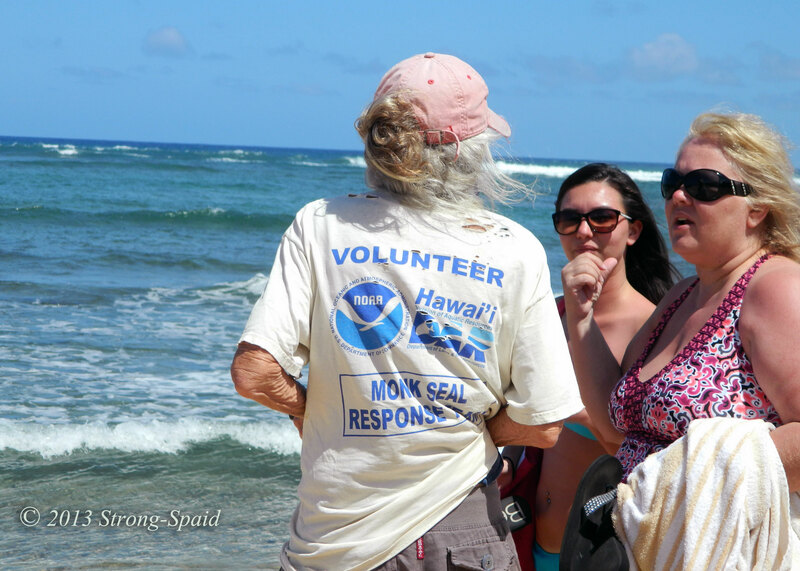 She talked to people who were passing by, and told them about the history and current status of the Hawaiian monk seal. She made it very clear that the continued survival of the seal is largely dependent upon human compassion and understanding. 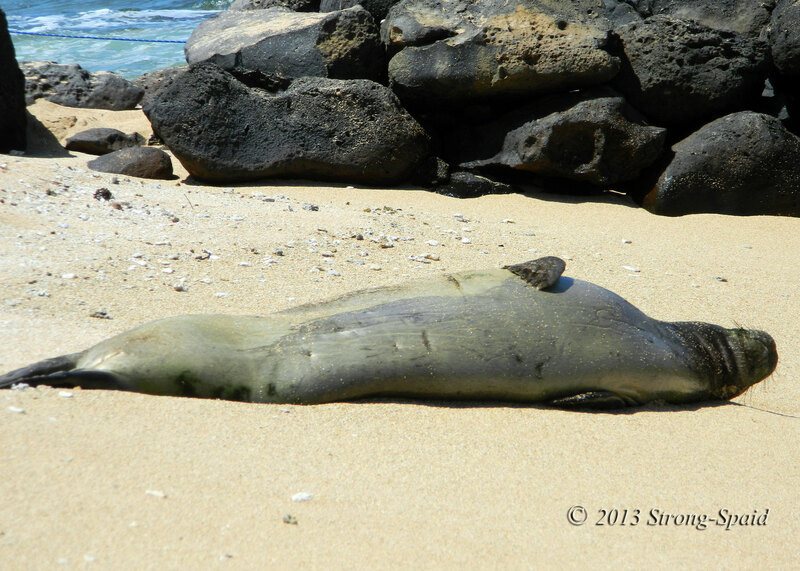 Many people who have not seen a sleeping monk seal before, think that the seal is stranded on the beach and needs help. This is not the case. It should be left alone. Coming too close to a seal while it is trying to rest could cause it to go back into the water prematurely. And, without adequate sleep, a tired seal might not have enough strength to deal with life in the rough ocean waters. The volunteers who watch over the sleeping seals are definitely angels. They freely give their time to assure that these endangered creatures are protected and not forever lost. Hopefully, through their efforts and the efforts of other concerned individuals and groups, the number of Hawaiian monk seals will soon begin to increase. 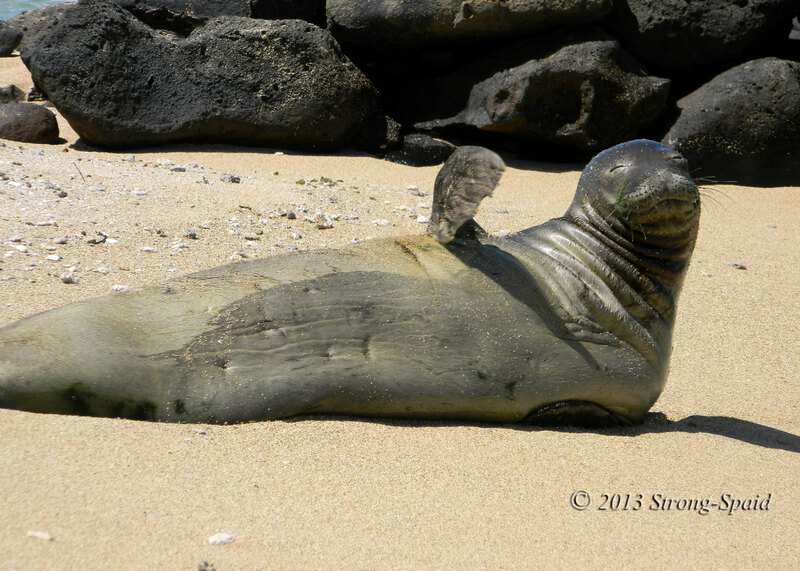 This entry was posted in Animals, Kauai, Photo Essay, photography, Travel, wildlife and tagged endangered species, Hawaiian Monk Seal Response Team, llio holo I ka uaua, mammals, ocean, seals. Bookmark the permalink. The seal is such a cutie! It’s a shame that they have almost been wiped out. Between predators, disease, people, and other factors….yes it is a shame. Hopefully, now that people are paying attention to the situation, the Hawaiian monk seal numbers will rise. Most adorable character I’ve seen in a long time. Hope the Monk Seals rise in number again. It would be sad if they were all gone….. Yes. It is so nice to see that there are so many kind and compassionate people in the world. Unfortunately, the news media usually focuses on the bad, so we rarely hear about these heart-warming stories. Use to live on Maui – and occasionally would be gifted by the sight of seals. Don’t know if they were monk seals, but so nice to read they are being watched over by angels….. Watched over carefully–they most definitely are! Yep. I didn’t know my Hawaiian vacation was going to include a trip to the emergency room with a very infected toe. I’m OK now. We, the humans, will ever learn when to stop? There are good people and bad. 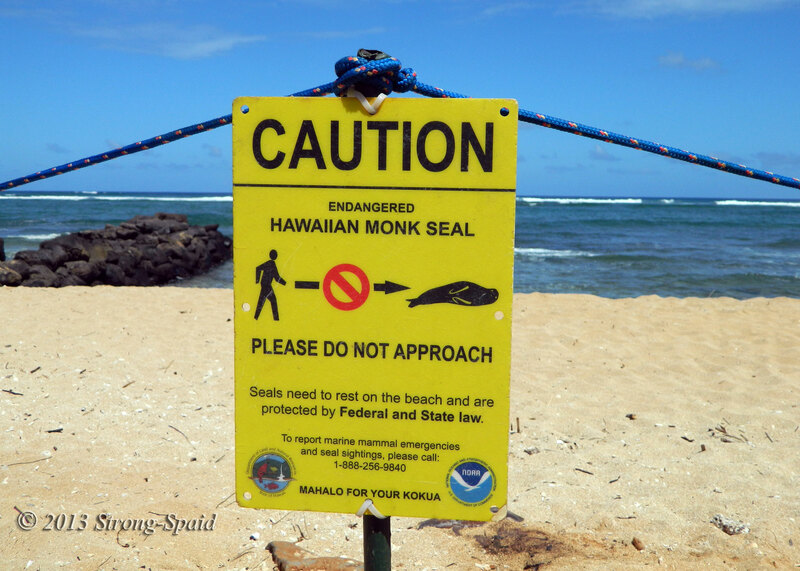 Many concerned humans have come together to protect and defend the Hawaiian monk seal. It is wonderful to see. Yes, it is wonderful. Good job. That was interesting. I think it is adorable. It is fascinating to know that people are there to watch over these seals they are in ever sense of the word – angels since they are ministering to one of Gods creations. Very interesting information. I would have assumed it was stranded and walked up to it. I would have done that too. Lying there, so motionless….many concerned people think that the seal is either sick or in trouble. It is a very good thing that the volunteers stay to help educate the people (from all around the world) who come down to the beach. I’m new to blogging on WordPress and am most appreciative of your visit and the “like” you gave me – thank you! I’ll certainly enjoy reading and viewing your posts. This particular story is of great interest; we have no monk seals here in Nova Scotia but our local species offer their own charm (and frustration to fishermen, sometimes). We often see them lounging around the shoreline. I’m glad there is such a proactive group looking out for the monk seals’ well-being and hope the seal population will rebound. Welcome Brenda…you are going to love blogging. It’s great fun. Just like in Nova Scotia, Hawaiian fishermen are often frustrated by seals too. Luckily, there is enough room in the ocean for everyone. Just have to keep an eye open and watch out for each other!. Thanks! I’ll learn to find time and I’ll enjoy exploring the blogsphere on WordPress. There are so many articulate and compelling writers here. Our northern seas are harsher and colder but rich with life. Right now, it’s the season of the great whales – humpback, minke, right whale and other species. Their presence awes and humbles me. It does look like the seal is waving, but…no. One wave came in a little higher than the rest, and rolled over the seal’s face. Bless those folks who care for the seals! I lived in Hawaii (island of Oahu) for 11 years, so when I came back to visit Kauai—I already knew about the Hawaiian monk seal and green sea turtle protections. There is up to a $5,000 fine and up to a 5 years imprisonment for touching, harassing, or disturbing a Hawaiian monk seal. Your post said that the lifeguard was frantically trying to stop people who were looking for a chance to rub the seals tummy. Whether they know it or not, those who choose to disregard the lifeguards, the ropes, and the caution signs…..are about to make a very expensive mistake! The people of Hawaii are assuring that the seals are protected, so I think there is hope! There are quite a few good people in the world, I think. Unfortunately, the news focuses mainly on what is bad, and we don’t hear much about nice things that are happening. These volunteers are giving these seals a better chance for survival, its true! What a wonderful and important post you’ve written. This should be the Poster Seal for the “Save the Monk Seals” cause! Thanks for the compliment, Marylin! I had never heard of these seals before. Thanks so much for posting about them! Also, thanks for visiting my blog and for the like on my post “Morning Beauty”! Thank you! The more people who know…..the better. Mary, I never realized this, though it makes perfect sense, thank you for telling us! I guess everyone needs a safe place to sleep! Unfortunately, many nights, I don’t seem to remember where or what sleep is! One good night sleep (without waking up)…wouldn’t that be wonderful. You too? Yes, it would be wonderful! Hoping it can be saved from extinction! What a great way to help protect the species. Great photo and what a ham for waving at you. Was this near Poipu?